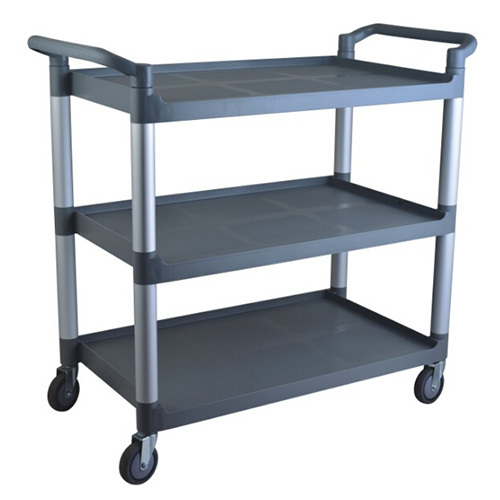 Easily transport a wide variety of supplies throughout your kitchen and dining area with this Choice 3 shelf utility/bussing cart! Perfect for hauling bus tubs, food pans, plates, flatware, dry ingredients, and more, this reliable utility cart moves essential items from one room to the next with incredible ease. With a smooth rolling design that anyone can use, this cart is ideal for any crowded restaurant, cafeteria, or catering event. A total of three durable plastic shelves can hold a wide array of items and are spaced evenly apart for optimal storage and capacity. Designed to offer outstanding control and maneuverability, a pair of dual molded handles are fitted to each end of the cart. They can be used to push or pull the cart through your facility and help ensure sturdy transport. It features 4 swivel casters with 2 brakes that allow you to maneuver around furniture and corners with ease. Each shelf combines to support 500 lb. of evenly distributed weight, providing your operation with limitless versatility. It ships unassembled to provide the best possible cost savings. Only a rubber mallet is required, and full assembly can be complete in minutes.